The last focus festival for The Cooper School was Diamond Cricket. There was a total of 5 schools attending; Fringford, Glory Farm, Finmere, Charlton-on-Otmoor and Launton. 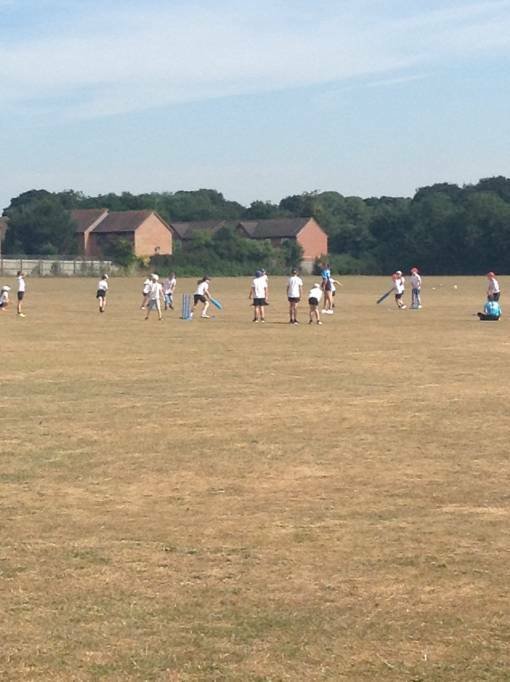 There were a total of 96 children playing cricket on the back field. Glory Farm arrived early, so were able to have a bit of coaching by the sports leaders, before the other schools arrived. The sports leaders were able to warm the children up before they were sent off to play their matches. Each team had 12 players and they were then divided into sub teams of 4 batters. The rules were slightly changed in that if one person was out in their 4, they were all out. This was done due to time restrictions. However some schools allowed other teams to come back in and have batting practice, if they were out very quickly. After the 5th dot ball was bowled, all 4 had to run at least one run. It was great to see all the children actively participating and cheering their team mates on. It was also encouraging the see the children’s confidence grow, especially as some hadn’t been that keen to participate.